The Pinnacle Creek Trail System located near the town of Mullens consists of approximately 70 total miles of trail. The Pinnacle Creek Trail System has one trailhead. This trail system is known for is breathtaking scenic views and is located less than one hour from world class whitewater rafting and a snow skiing resort. 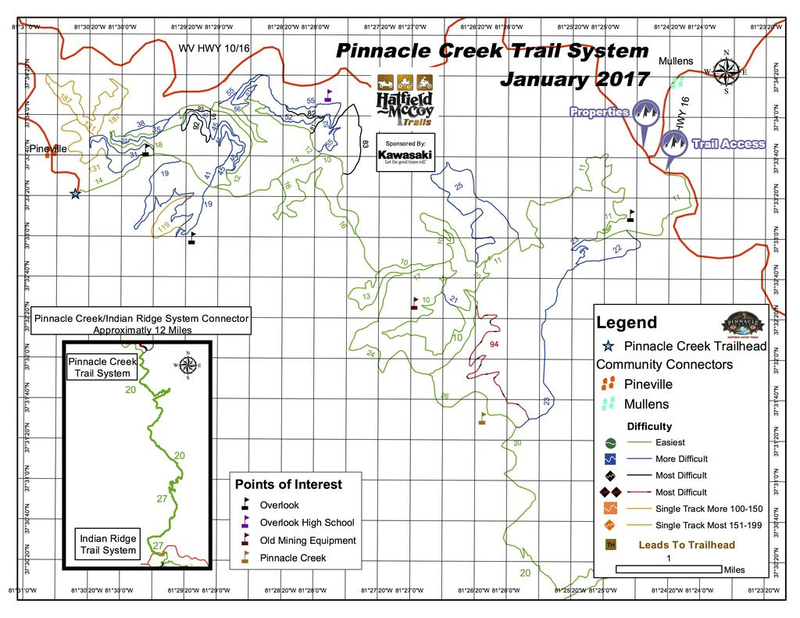 The breakdown in trial percentages for the Pinnacle Creek Trail System are as follows: 41% are green trails (easiest), 43% are blue trails (more difficult), 12% are black trails (most difficult), and 3% are orange trails (single track only). This trail system has direct access to food, fuel, and lodging in the city of Mullens, West Virginia. The Trailhead has a 2+ acre parking lot, staffed trailhead, onsite restrooms, permits and merchandise.